This is a book that answers all the ancient philosophical questions: about the good, the right, the true, the nature of mind and soul, divinity, immortality, and free will. It does so not by windy argument, but by the discoveries of the forbidden sciences created by Toynbee, William James, C G Jung, Dr Humphrey, and many others. For every question, there is some realm of experience which can provide an answer, using the essence of scientific method: reproducibility and ruling out the alternatives. If you want to know the solution to the classical problem of evil, don't ask a theologian; ask a mystic, one who has experienced cosmic consciousness, and has seen the pattern that runs through all things. These new sciences are forbidden in the universities, but they flourish, nonetheless, including the study of UFOs. Are they real? Why don't they make contact? How is it possible to jump hundreds of light years in an instant? If ETs are at all common, why didn't they colonise the Earth? 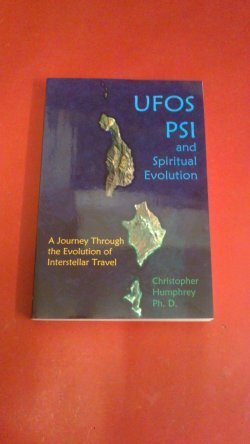 The answers to these questions provide the unifying theme of this book, our own journey to the stars by levitation and teleportation. We take our first step to those powers by attaining spiritual maturity. We begin our spiritual evolution by learning the answers to the perennial philosophical questions. If it seems impossible to do all this in 280 pages, then read carefully, for Dr H does not waste words or repeat himself. If you think it impossible in any number of pages, read his chapter on 'The Function of Philosophy'. Dr H knows what that is, while those who scoff are often mere sophists or professional sceptics. 280pp.